INDEPENDENCE, La. (CNS) — St. Padre Pio, St. Teresa of Kolkata and St. Michael the Archangel are among the saints keeping a close watch over students at Mater Dolorosa School in Independence. “This is what we came up with,” said Santangelo as she opened the door to a large, brightly lit room with cream-colored walls. 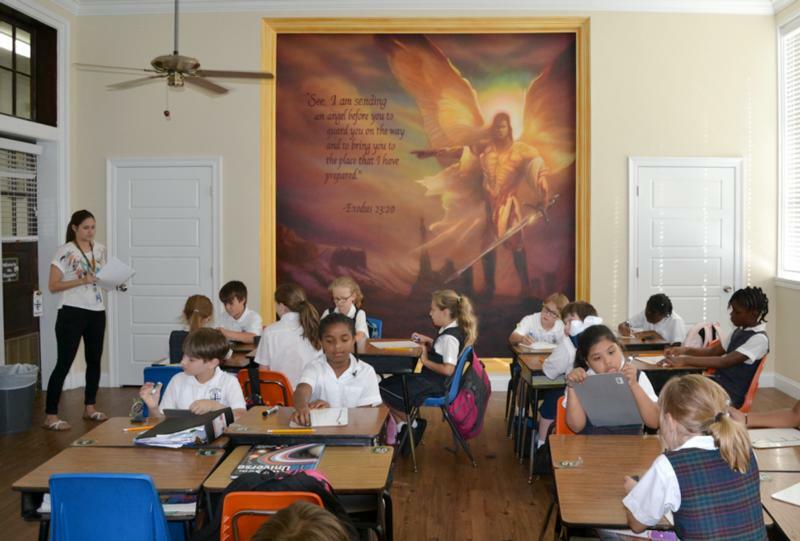 The room was filled with students, working at computer stations but above them on the ceiling was a huge image of Mary Queen of Peace looking down on the students. He told The Catholic Commentator, newspaper of the Diocese of Baton Rouge, that the nine paintings at the school took 513 hours total. “It reminds you why we’re here. It’s a good reminder and it’s great art,” said Liz Brady, a substitute teacher for eighth grade in the St. Padre Pio classroom. Santangelo said she was inspired to “put religious feelings back in the school” after a discussion with a local priest. Also, the death of her son, Johnny Santangelo, 30, from a brain tumor in March 2016 gave her a new insight into her faith and makes her view her work as a mission, not a job. “It’s all about God and giving our faith to the Lord. And, I wanted to bring the Catholicism back into the school,” she said.